Messi has been ruled out for three weeks after sustaining a fractured arm in a heavy fall during Saturday's 4-2 LaLiga win at home to Sevilla. Barca have not won a Clasico without Messi since he made his debut for the club in 2004 and they failed to beat Athletic Bilbao when he was rested last month. Valverde is under no illusions about the challenges ahead without his talisman but suggested Messi's absence may allow other players to step up. "It is clear that it is a sensitive low," Valverde told reporters. "In the end, it is about who he is and we know what he gives us. We all know what the opponent thinks when they play Leo. "But we have to know that he will not be available and we have to face it. We will prepare for it but of course we are going to notice the loss of Messi. "There have been games that Leo has not played in. He is fundamental and he marks a lot of the team's game, but we will try to keep our idea and take a step forward. "We will miss him, win or lose, but we want to miss him winning." 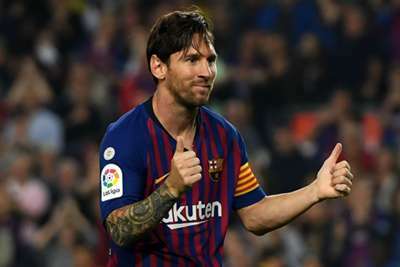 Barca, who moved top of the table after recording their first LaLiga win for over a month, led 2-0 against Sevilla when Messi was replaced, the captain having set up Philippe Coutinho for a second-minute opener before doubling the lead himself. "It was a bit difficult for us to close the game," Valverde added. "It was a game against a good team, which has demanded a lot, marked by Messi's injury. "And now we are first, which is no nonsense, seeing how close the league is. "I know there are times when the strikers are more or less successful, but in the end the work of Luis Suarez is always there."